During the lockout, some teams changed arenas, others asked for new ones, and some even pushed forward with condo towers and complexes. After a prolonged NHL lockout, hockey is back. The seemingly interminable delay left the downtowns of many hockey towns quieter than usual. But while restaurants, bars, and parking attendants were taking big hits to their bottom line, many NHL teams stayed busy, Or at least, their development guys did. Some teams changed arenas, others asked for new ones, and some even pushed forward with condo towers and mixed-use complexes. A surface lot that faces the First Niagara Center (where the Sabres play) and Inner Harbor will be turned into a mixed-use complex featuring two hockey rinks, bars, restaurants, shops, and a hotel. The city’s Inner Harbor has been developed modestly so far, but Harbor Center’s scale should accelerate the neighborhood’s transformation into a year-round destination. Construction is scheduled to begin in March. The Sabres are also partnering with other businesses in the neighborhood to revitalize Perry Street, which abuts First Niagara Center and the new Buffalo Creek Casino. Though the redesign won't take care of the stretch of undeveloped parcels that serve as surface lots, it proposes a more stylized streetscape that aims to attract pedestrians and bicyclists. The hope is that it will encourage development along the city’s Inner Harbor and Cobblestone districts. Work on the project could begin this year. Joe Louis Arena (completed in 1979) doesn’t meet the standard of most modern day arenas. With that in mind, Red Wings owner Mike Illitch wants a new facility and an entertainment district to go with it. Estimated to cost $650 million, the site for such a project has not been announced, but real estate obsessed locals have narrowed it down to a couple different neighborhoods. Oilers owner Daryl Katz first began talking about a new arena and entertainment district four years ago. 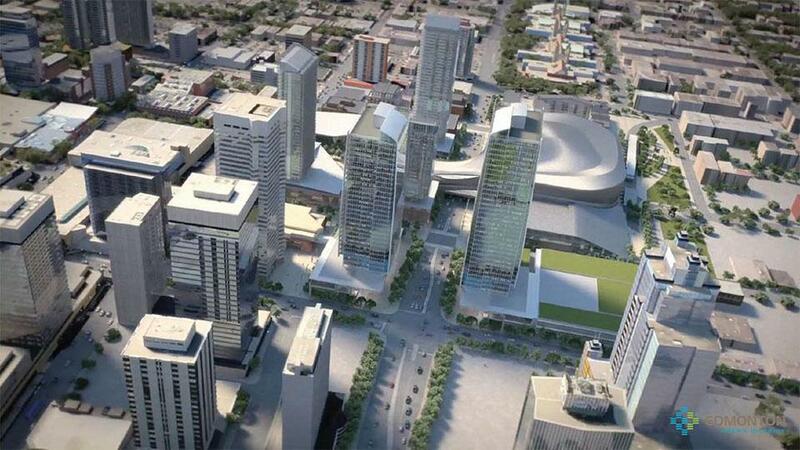 The project, which could total $2 billion, would give Edmonton a contemporary mixed-use district. And the team would no longer suffer the indignity of playing in one of the oldest and smallest arenas in the league, about 2.5 miles northeast of downtown. But Katz has repeatedly frustrated the City Council by asking for new perks. The Oilers owner perhaps went too far, pulling the ultimate scare tactic of getting on a plane to another city (Seattle) to discuss relocation. Throwing gas on the fire, he brought Wayne Gretzky with him. Katz later published an apology letter in the Edmonton Journal. Negotiations are still ongoing, now with a third-party mediator. A new land agreement deadline is set for April. The Canadiens have long been part of Montreal’s identity, now they'll be part of its skyline too. Tour des Canadiens will be a 48-story luxury condo tower built next to the Bell Centre. Its marketing campaign is all about presenting the luxury condos as a way for fans to attach themselves even further to their team. Pitching the idea of living on team property may help explain why sales have been so brisk. The developers are now looking to add more floors to what will already be the city’s tallest residential building. The top of the tower will be decorated with the team’s logo. Last October, the Islanders announced that they would be leaving Nassau County and moving into the Barclays Center in Brooklyn. The announcement came after several failed attempts to build a new arena and mixed-use community at their current home. It’ll only be a 20-mile change when the team first takes the ice at Barclays in 2015, easier for its fans to stomach than a relocation to Kansas City or Quebec City as previously rumored. The Coyotes, the NHL’s most financially troubled team, may finally be closing in on a secure future. Potential new team owner Greg Jamison will be paid $300 million over 20 years to run the Jobing.com Arena, owned by the city of Glendale and part of a bigger shopping and entertainment complex. The arena isn’t in a particularly dense area (even for Phoenix MSA standards) so having a long-term tenant is not only vital for the arena but for the adjacent developments as well. The deal is official once his acquisition of the team is complete. The Penguins saw the Igloo, the team’s old home, come down last March. Now, they're legally obliged to redevelop the 28-acre site. The team has 10 years to develop the area. That vision could include 800,000 square feet of office and retail space and over 1,000 residential units. While preservationists lost the fight to save the architecturally unique arena, the street grid the Igloo erased when it was built will return as part of the redevelopment.